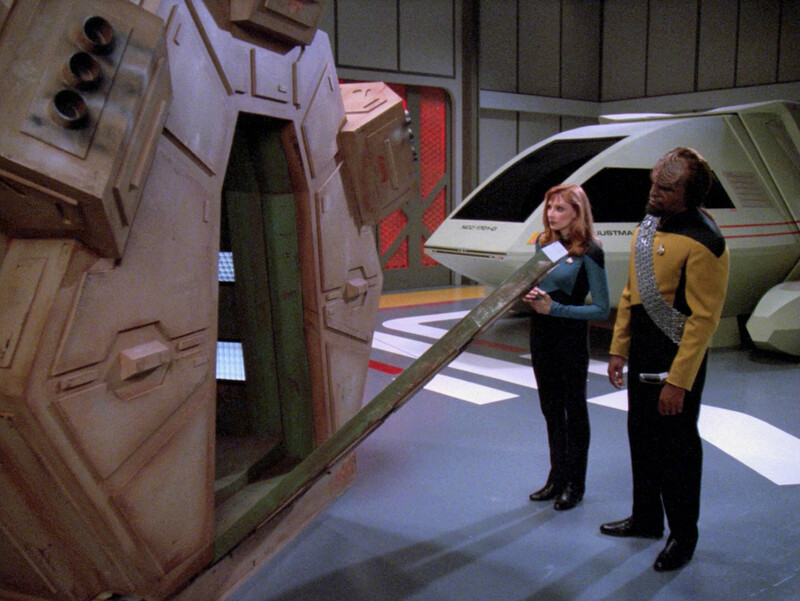 The interior of the life-size mock-up that first appeared as the Zibalian shuttle in TNG: "The Most Toys" was re-used several times. In some cases it served as the cockpit of a shuttle whose exterior was as well based on the Zibalian shuttle (most notably the Nenebek), but also for some unrelated designs. 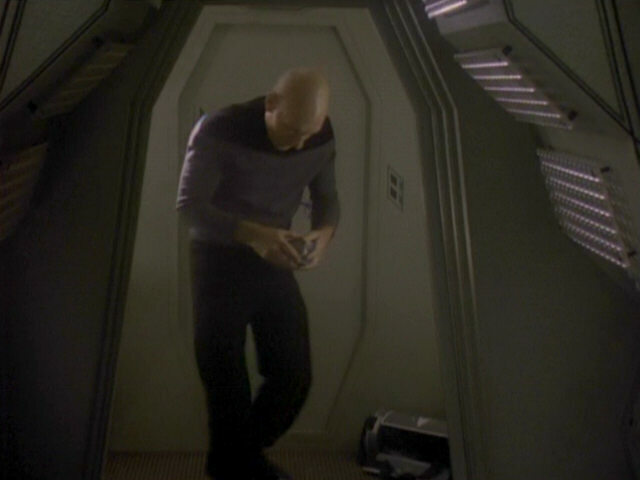 And it appears that the aft part of the interior is still older than the shuttlepod exterior from "The Most Toys". 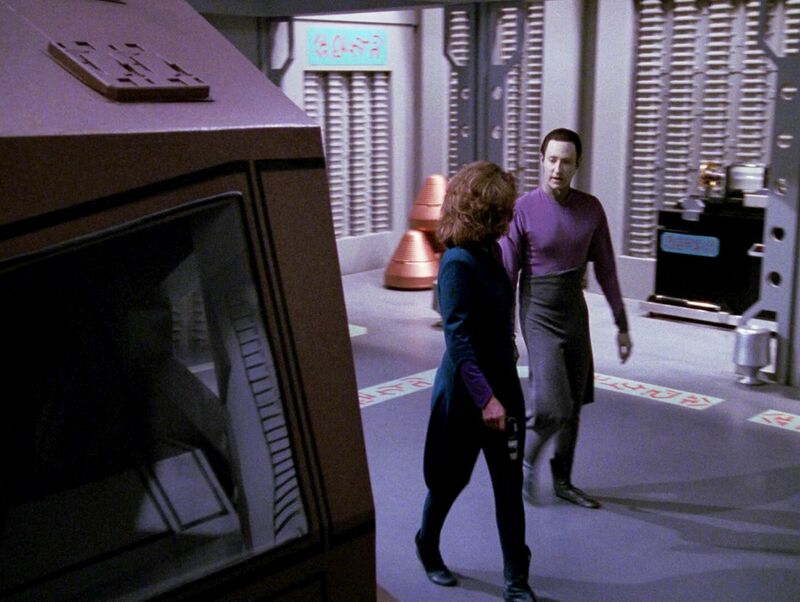 We assume it showed up in three previous episodes before it was modified in a way that it could also be filmed from the outside. 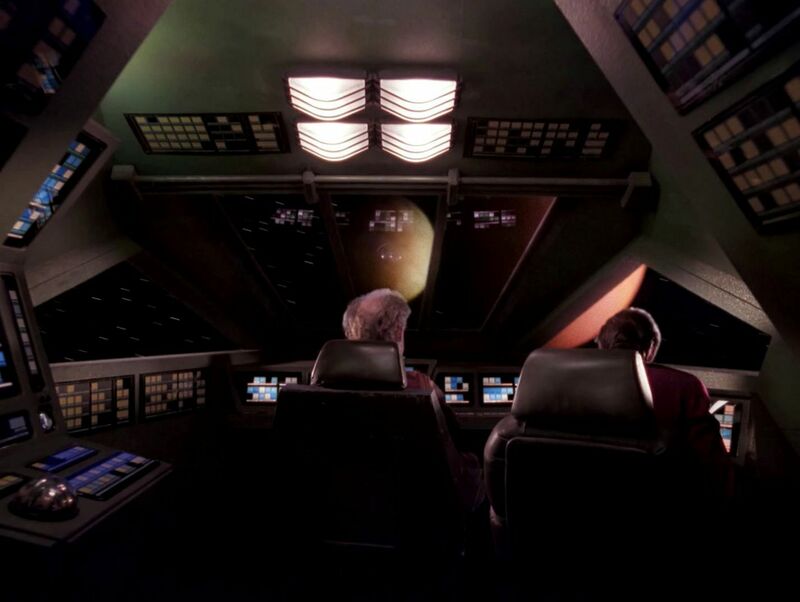 This article investigates the whole design history of the alien shuttle interior set. The appearances of and modifications to the mock-up and the miniature are described in the separate article Redresses of the Nenebek. 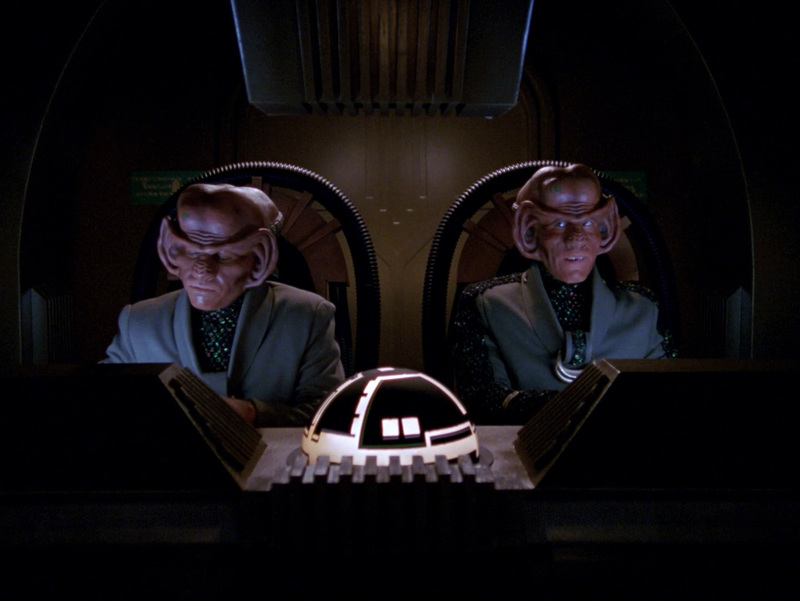 Looking at the shots of the Ferengi cockpit from "The Price", we can see vertical side walls behind the two chairs that are curved upward. 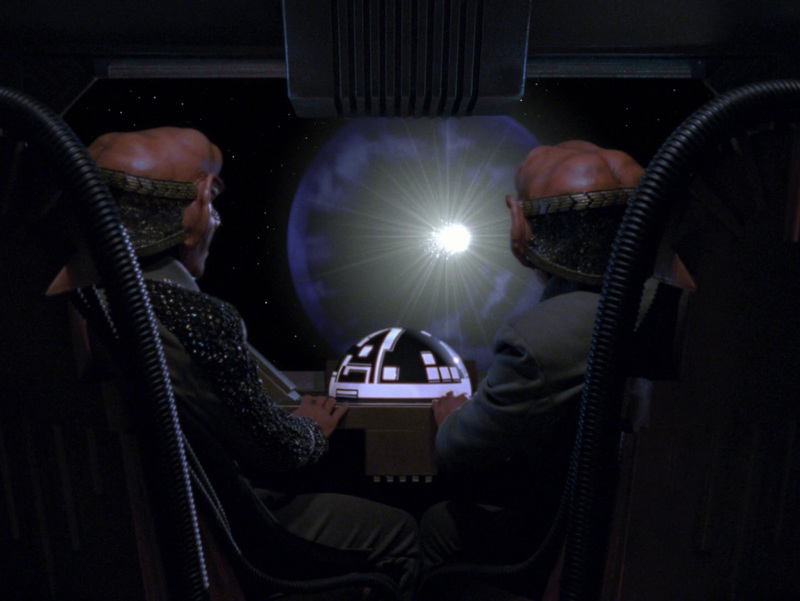 The Ferengi shuttle has one big front window. 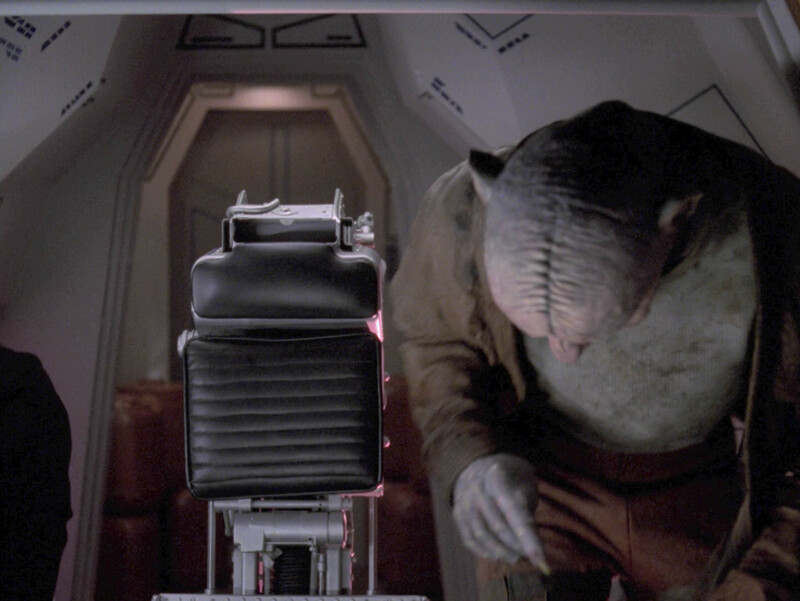 Since there are no lateral windows on the Ferengi shuttle miniature, the set may not include these windows yet that will be rather prominent on some later iterations. 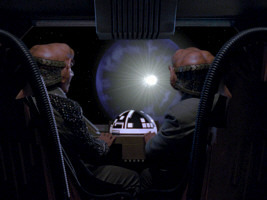 Ferengi shuttle cockpit in TNG: "The Price"
Consoles in the form of characteristic tapered boxes on either side of the characteristic dome can be seen in front of the two pilots. 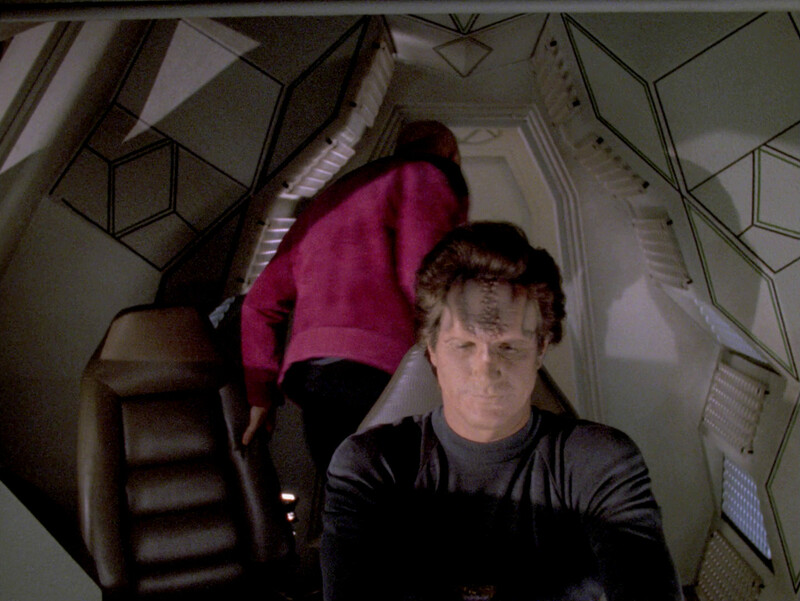 The walls in the aft part of the cockpit were modified for the Romulan scout and are not curved any more. However, it is possible that the curve is only hidden behind new sloped straight wall panels. In any case, the slope will remain the same in all following iterations. 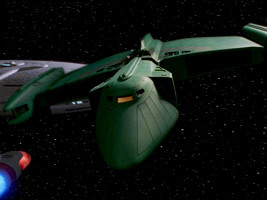 The Romulan scout model exhibits a big front window and two lateral ones. Perhaps the lateral windows were added to the interior set for "The Defector", although none of the two shots of the set that appear in the episode show these windows. 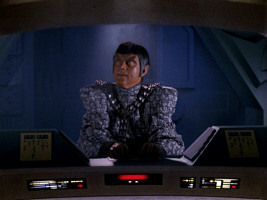 Romulan scout cockpit in TNG: "The Defector"
Romulan scout in TNG: "The Defector"
The pilots' consoles of the Romulan scout are clearly the same as on the Ferengi shuttle in "The Price". 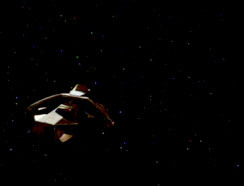 The shape of the cockpit of the Angosian transport in "The Hunted", as seen from outside, would fit with the later Zibalian shuttlepod cockpit of "The Most Toys". 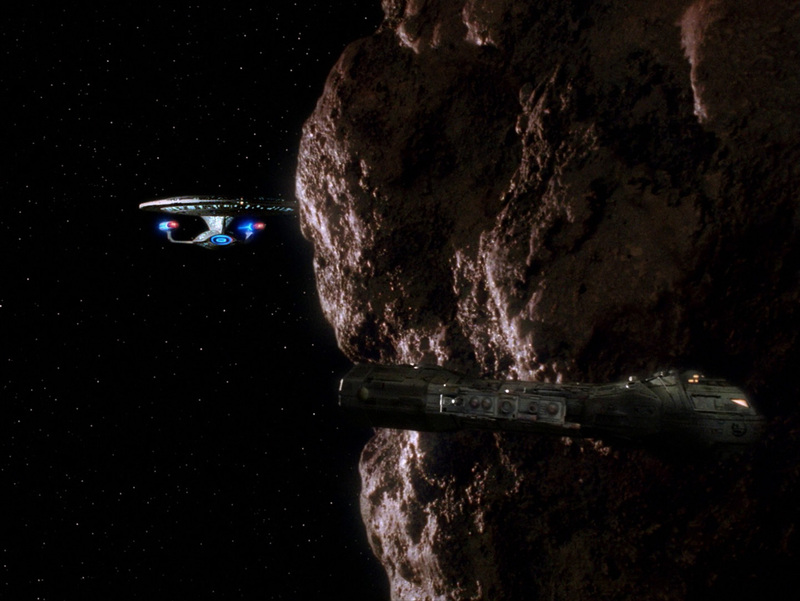 While the entire head section of the Angosian ship is much more rounded, we can see it has a large, nearly rectangular window in front, like the Zibalian shuttlepod whose windshield is only slightly indented on top. The transport also has two roughly rectangular windows on port and starboard with a horizontal upper edge, just like the shuttlepod. 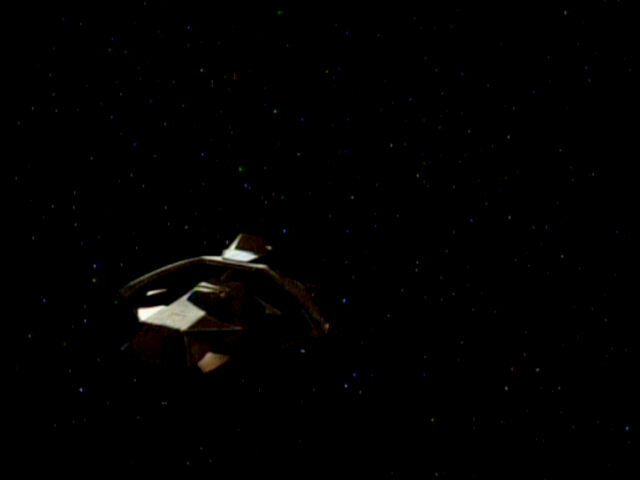 Moreover, the angles in the roof of the Angosian transport appear to the same as on the Zibalian shuttle. 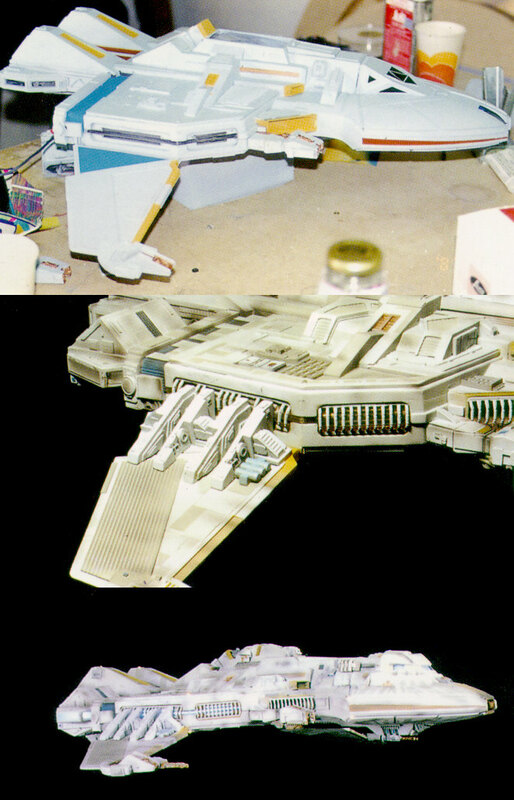 This all points to a previous life of the Zibalian shuttle (and later Nenebek) mock-up as a mere interior set, and that the exterior was fleshed out later, for "The Most Toys". Angosian transport cockpit in TNG: "The Hunted"
Angosian transport in TNG: "The Hunted"
We can also see that the Angosian shuttle already has the rather prominent octagonal aft door. The two already mentioned lateral windows that are visible from the outside don't come into sight because the door frame covers them. Since light is coming from port and starboard just as well as from the windshield, two windows are likely actually located in these places. 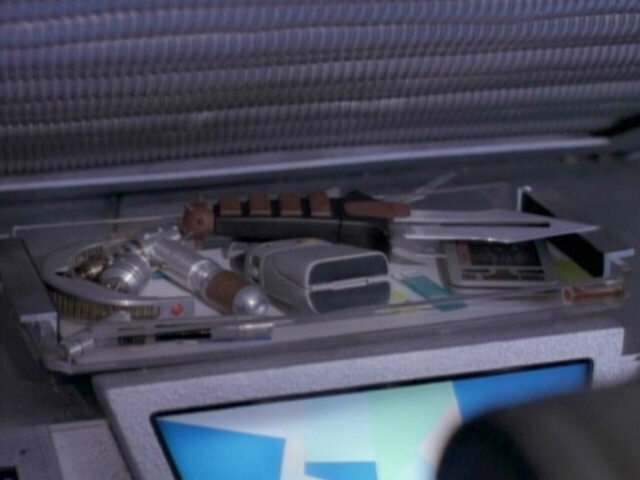 The consoles in front of the cockpit are the same as already in "The Price" and "The Hunted". 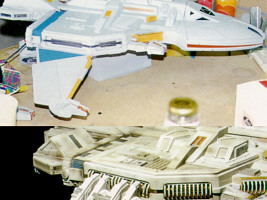 Summarizing, it is very likely that there were appearances of the cockpit set prior to "The Most Toys" when the exterior of the set was created. 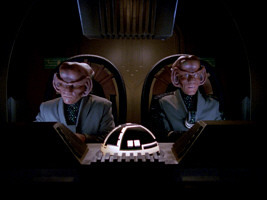 The re-uses of the Ferengi shuttle console is more evidence that the cockpit is still older. Until "The Most Toys" it only appeared together with the whole set. 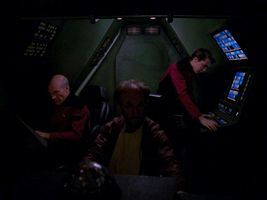 When the set was modified for the escape pod in "Transfigurations" with its tapered front, the console was removed and used for unrelated sets such as in TNG: "Future Imperfect" and "Data's Day". We can notice that the console in the Zibalian shuttlepod is the one previously used in the cockpit of the Ferengi shuttle in "The Price", on the bridge of the Romulan scout in "The Defector" and on the bridge of the Angosian transport in "The Hunted". The aft portions of the two latter sets already look a lot like the corresponding area of the Zibalian shuttle. Zibalian shuttlepod cockpit in TNG: "The Most Toys"
We get only a brief look at the interior when we see Data inside through the windows. 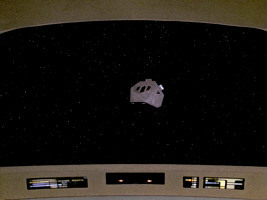 The complete aft portion of the cockpit interior (the four aftmost concentric shapes visible from the outside) was reused in the later appearances. 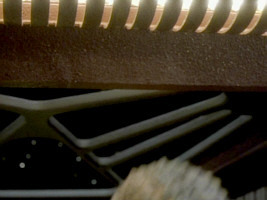 Comparing the look in "The Most Toys" with the one in "Final Mission", we recognize that the side walls are identical. For the later reuses the aft part was adopted. The angular and boxy forward part was replaced with a tapered one. 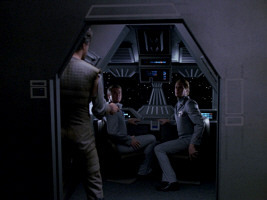 The cockpit was redesigned for this episode. The aft part of the cockpit section still exhibits the same proportions as before, such as in "The Most Toys". The protruding structures that were affixed to the walls in "The Most Toys", however, were removed. Instead, a bulky console was added to the port side. Nenebek cockpit in TNG: "Final Mission"
The consoles of the captain and the Ops console on the starboard side are new as well. The old consoles with the tapered tops (from the first four appearances of the interior) probably wouldn't fit into the new pointed front tip of the shuttle (that was created for "Transfigurations" where it didn't matter as we could only see the outside). 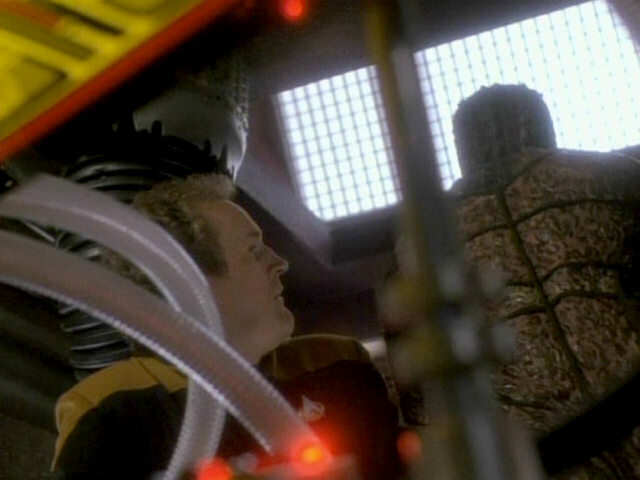 In addition, there are numerous black areas with yellow buttons in the forward area of the interior. 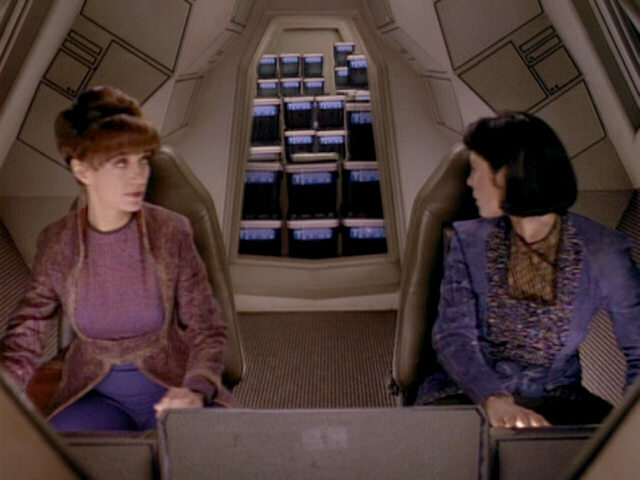 There are four characteristic ribbed lamps above the cockpit window. Two of these lamps are also above the door leading to the aft section. 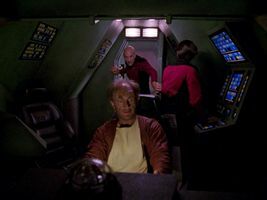 A new aft section was added to the set, in order to allow Dirgo and Wesley to have a word about Captain Picard, without Picard noticing that. We can see relatively little of this new aft section. 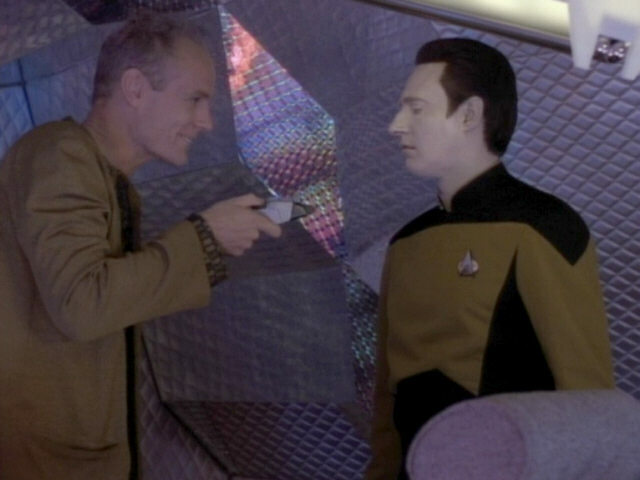 But also on this side, there are two of these lamps above the door to the cockpit. The aft section is simplistic. The walls are painted green. To the left of the aft door there are black areas with yellow buttons, like those in the cockpit. 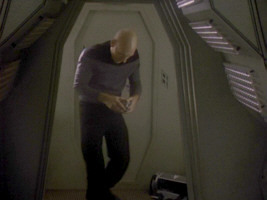 Nenebek aft compartment in TNG: "Final Mission"
Two rectangular boxes with two diagonal struts in them were moved from the upper side walls of the interior of the Zibalian shuttle to either side of the hatch on the rear wall of the new aft section of the Nenebek. "The vessel's interior, similar to its exterior, is truly futuristic, with multifaceted panels containing minimal blinkies." The interior exhibits a clearly more complex faceted surface on either side of the door. The former wall simply consisted of an upright and a sloped part. 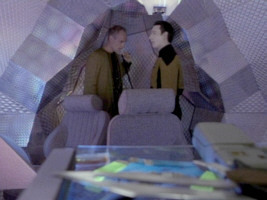 Time travel pod interior in TNG: "A Matter of Time"
We can still recognize the location of the lateral windows from the inside. They were covered with a tube-like, ribbed material. The big rectangular front window was obscured as well, but here the cover is not ribbed. 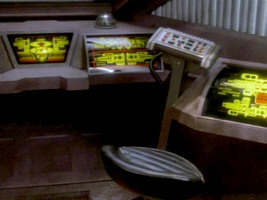 Furthermore there are two consoles, the front console of the captain and a lateral Ops console, both with individual chairs. 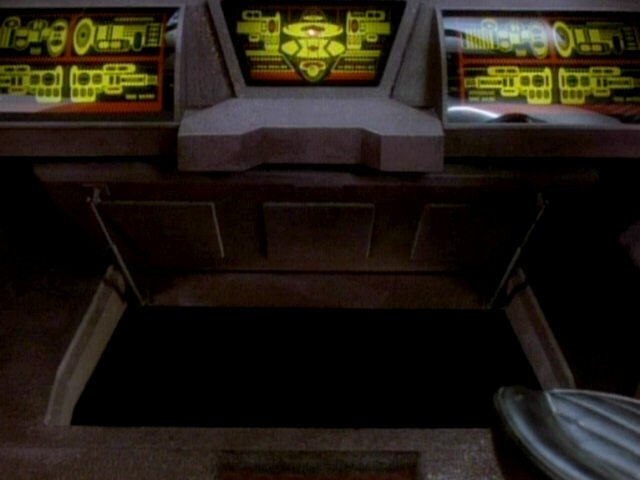 The forward console was slightly reworked, and would look like this until its last appearance in "Preemptive Strike". There is a central console that has a tapered viewscreen with the narrow side on the bottom. On this console that is overall a bit taller than the two adjacent ones, we can also see the tray with the equipment stolen by Rasmussen. 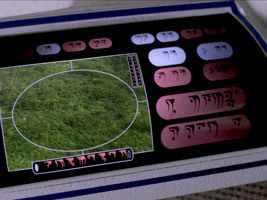 The Nenebek already had this console. The lateral consoles on the left and right were reworked for its appearances in "A Matter of Time". In "Final Mission", they still had about the same slope as the central one. In "A Matter of Time", on the other hand, they are curved in a convex fashion. There is no recognizable interface but only illuminated stripes on the surface. The Ops console was reworked just like the lateral consoles. It is curved, and has a colorful stripe display. Looking ahead at later appearances of the cockpit set, the consoles will remain curved and the central console will retain its trapezoid shape, without exception. So several of the modifications to the otherwise rather exotic time pod were retained. The cockpit has only one appearance outside TNG, in the DS9 episode "Captive Pursuit" where it is located on Tosk's ship. 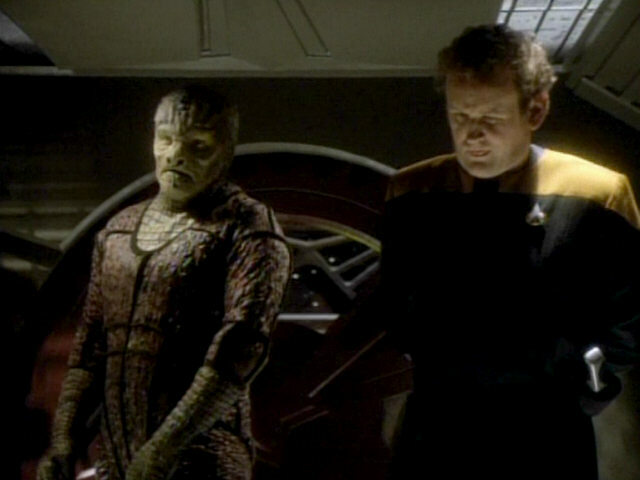 From the outside, however, Tosk's ship is represented by the redressed Vulcan ship from TNG: "Unification II". 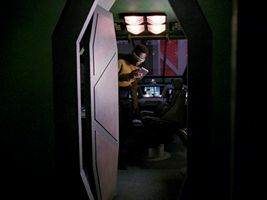 Tosk's ship in DS9: "Captive Pursuit"
This is the second time we see the interior with the characteristic wall panels that were introduced for the outlandish time pod in "A Matter of Time". The panels were repainted rusty brown for "Captive Pursuit". Tosk's ship's cockpit in DS9: "Captive Pursuit"
The aft compartment that was added for "Final Mission" is not part of the set for Tosk's ship. On the two sloped lateral surfaces we can now see yellow and illuminated consoles. 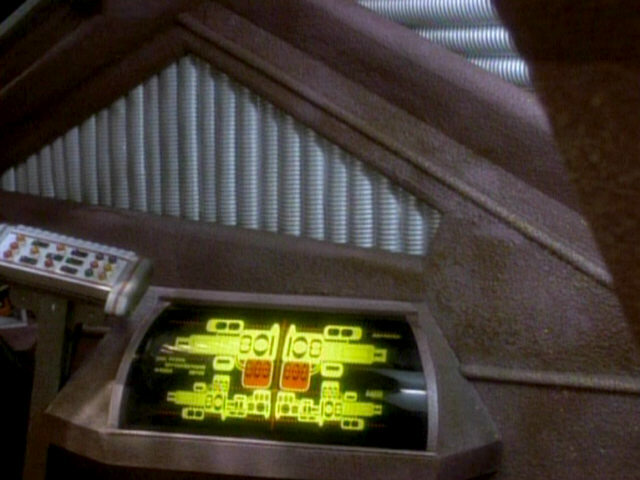 We can also recognize that two more of these consoles are obviously located lower on the side wall. 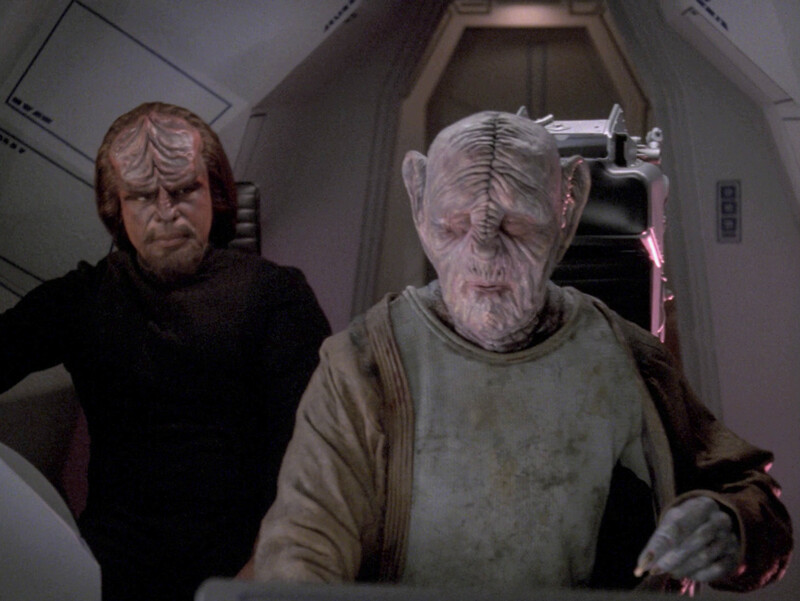 This will become more clear on later appearances of the cockpit (Iyaaran and Klingon shuttle) where we will be able to identify four of these areas altogether. 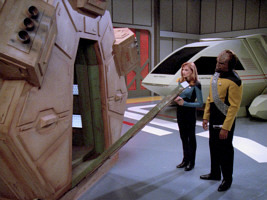 The shuttle hatch was reworked for this appearance. It has a characteristic pattern when closed and is now heptagonal. There are two edges on the bottom, one on top, and one shorter and one longer on each side. Towards the end of the episode it is revealed that this is actually a sliding door, whose two halves meet in the middle. 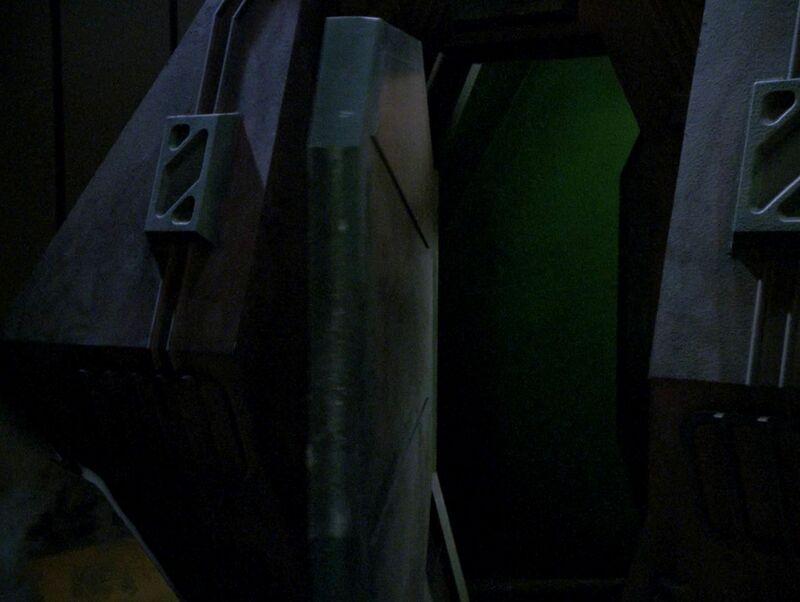 We can see repeatedly how O'Brien and Tosk enter the ship from the docking ring of Deep Space 9 directly through this door. Looking at the model of the ship and the size of the windows, it seems just possible that the door is located at the aft end of the ship. 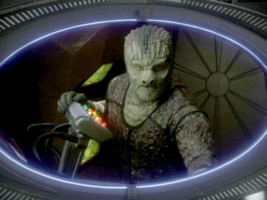 Tosk's ship's hatch in DS9: "Captive Pursuit"
It is noticeable that the interior of the cockpit already contains the two extra windows that the model will have in "Liaisons". In its other appearances this area was covered. In "Captive Pursuit", the outside of this window is covered with some sort of tubes, just like the two other (older) lateral windows. Only the windshield is open. The front window has a different structure than on the other shuttles, as is recognizable on the ship model. 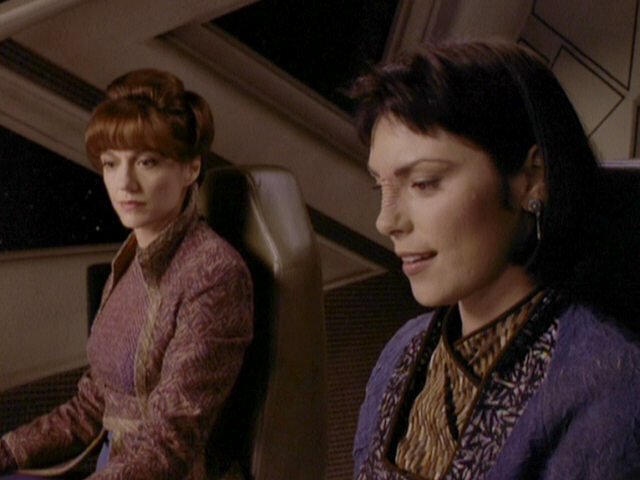 The exterior shots are overexposed in this area though, so we can't recognize the window pattern. The question arises why the two new triangular windows were added in the first place, only to be covered again. 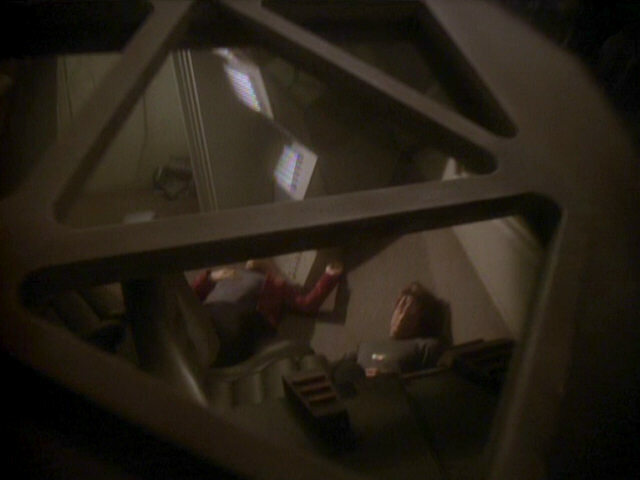 It is possible that they existed as soon as in "A Matter of Time", only better obscured behind a wall panel. 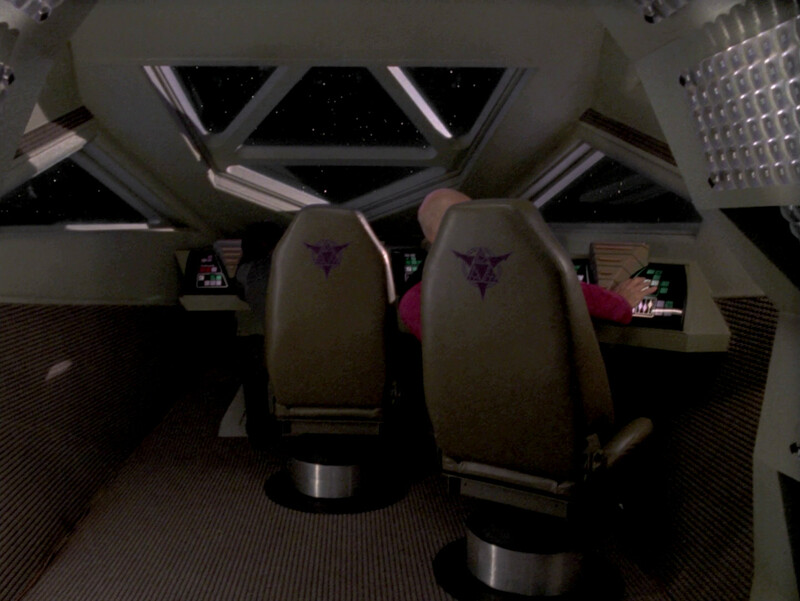 In "Captive Pursuit", the cockpit should have no lateral windows at all, as these would not fit with the exterior of the T'Pau model. 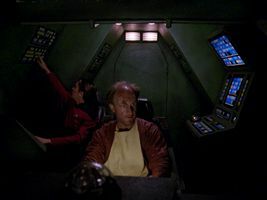 We can't tell what happens with the window the next time the interior appears in "Birthright I", because the cockpit is filmed in a way never to show this area. Since the Nenebek miniature is reused for the space scenes in "Birthright I", it is clear that there are only the two lateral windows on the Yridian shuttle too. 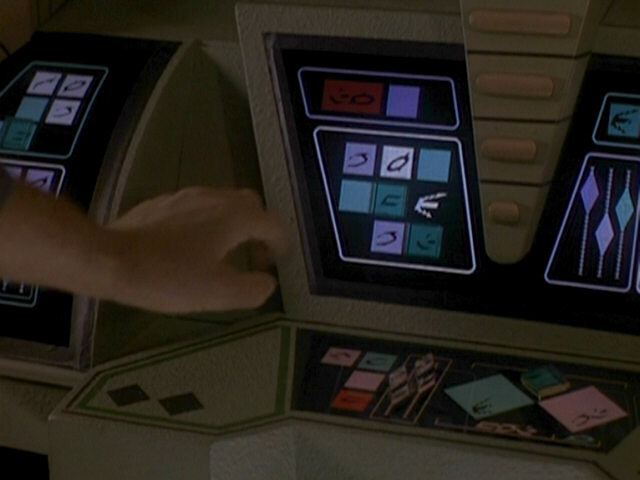 The consoles in Tosk's ship exhibit some new displays, but their shapes remain overall the same. The Ops console as well as the two lateral forward facing consoles are still curved as in the time pod. The central console is still tapered. 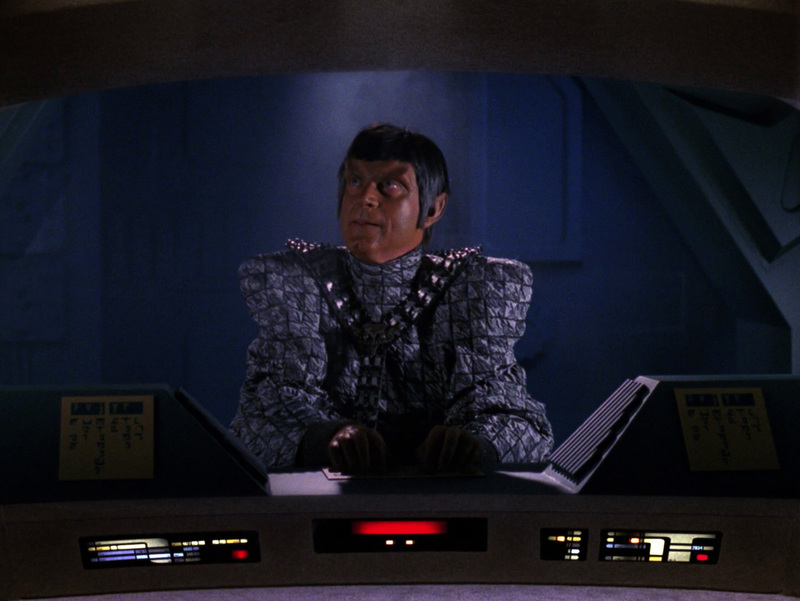 As Tosk's ship is built for just one person, there are no two chairs as previously but some kind of stool with a small display and some buttons. From this stool, on which Tosk is sitting in the very first scene, it is possible to operate the lateral console as well as the forward controls. Lower level of Tosk's ship's cockpit in DS9: "Captive Pursuit"
A floor hatch was inserted into the forward area of the cockpit set. We can see how Tosk and O'Brien are working in this new lower area. 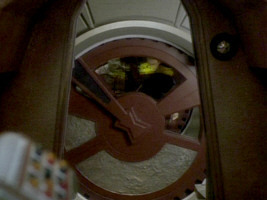 As the opening of this hatch and the illumination seen from there fits with the existing interior of the set, we assume that a new room was actually built underneath the cockpit set for this episode. In "Birthright I" we can see a further iteration of the cockpit set. 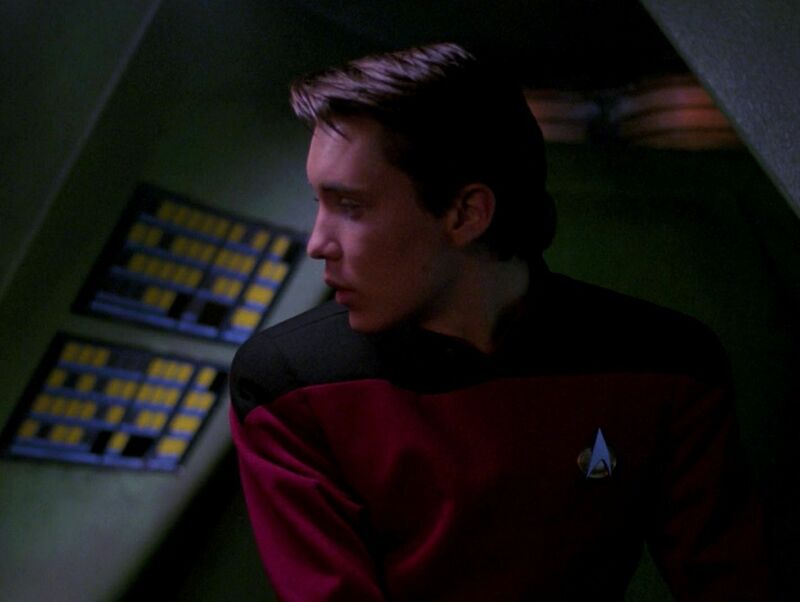 In the place in the aft area of the cockpit where there was an illuminated yellow panel on Tosk's ship (a display), we can see a pink illuminated area that doesn't look like a display. For a brief moment a similar area in the lower half of this part of the cockpit comes into sight. Just as on Tosk' ship, there are two lower illuminated areas. These will become more visible on the Iyaaran shuttle and the Toron-class shuttle. Yridian shuttle cockpit in TNG: "Birthright I"
Whereas the walls were still brown in Tosk's shuttle, they are gray-beige in the Yridian version. 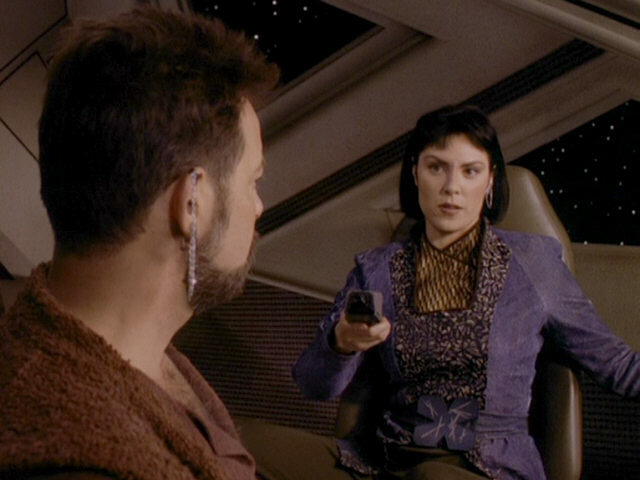 Also, there are black stripes and pattern on the wall panels. The aft compartment of the shuttle is visible for the first time since "Final Mission". 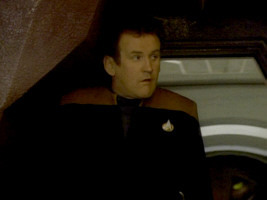 The shape of the door frame between the two areas looks like in "Captive Pursuit". But there seems to be no door at all. The aft compartment holds some cargo containers. 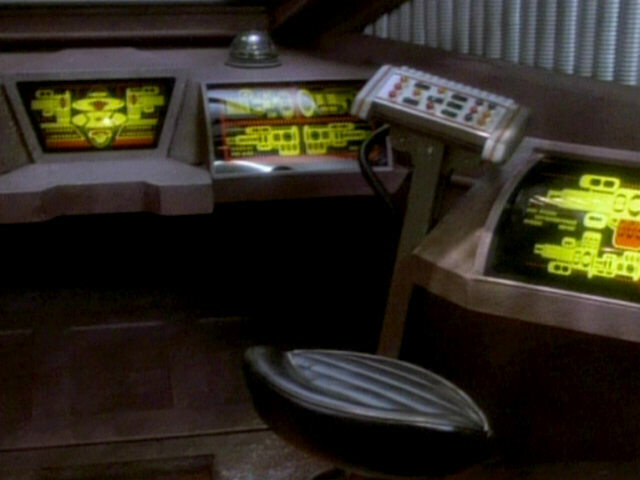 The chair of the Ops console is quite simple, the one of the captain much more elaborate. 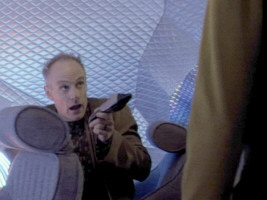 We get only a brief glimpse of the lateral port window of the set. 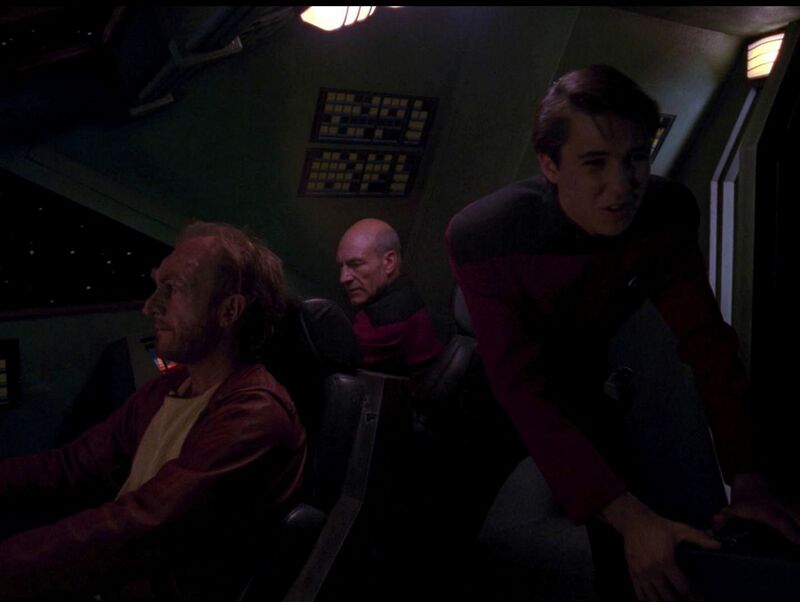 This brief take is filmed in a way neither to expose the big cockpit window, nor the two new triangular lateral windows, whose inclusion to the interior set is still a bit of a mystery. They must not become visible, as the unchanged shuttle miniature of the Nenebek doesn't have them. The forward consoles are not really visible either. 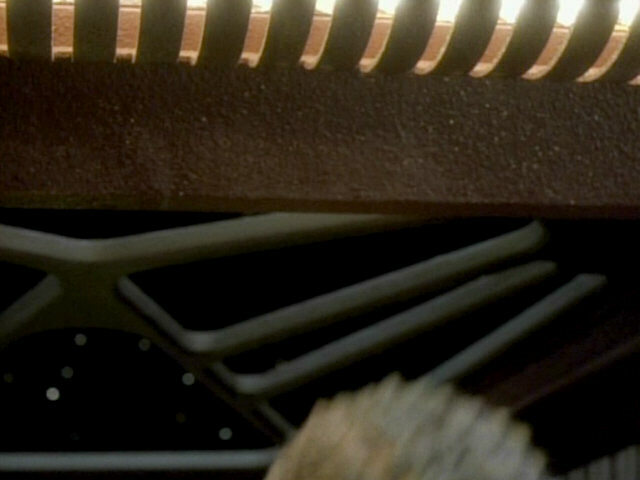 We can only see on a close shot of the Ops console that it is still curved, just like it was on Tosk's ship and initially in the time pod in "A Matter of Time". While the exterior was modified extensively for this episode, the shuttle interior of the Iyaaran version is largely unchanged. On either side of the door, we can see illuminated areas again. 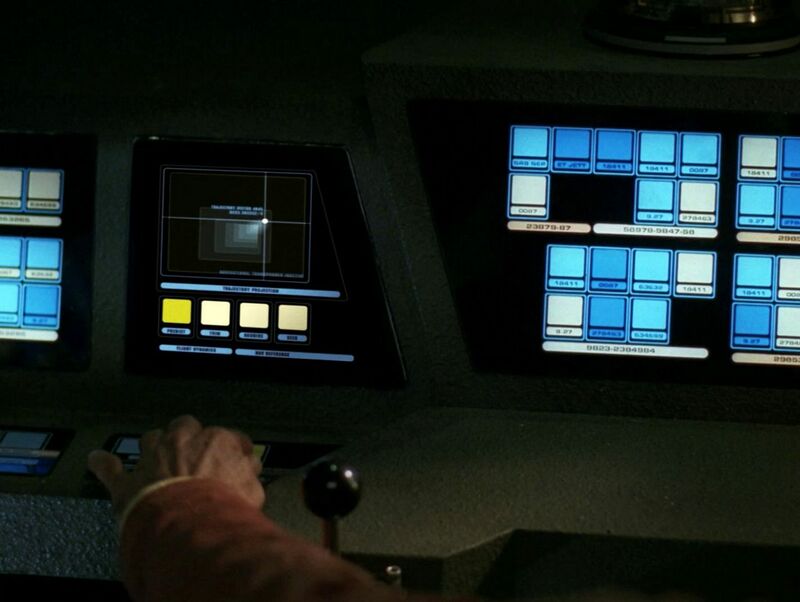 Once again, they look more like lamps than like control panels. 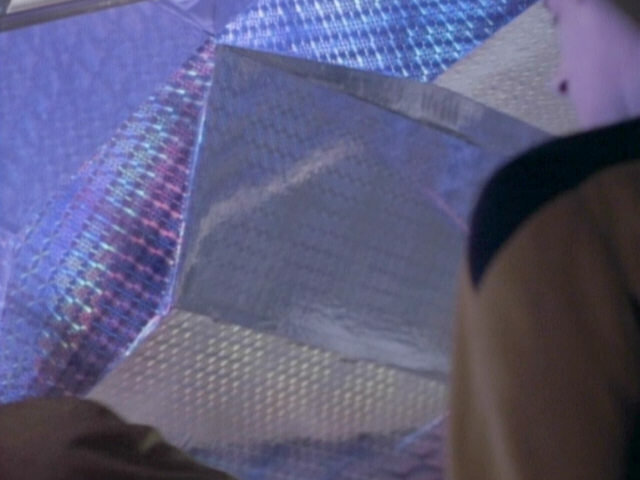 The other areas are covered with the transparent, slightly sticking out material. Iyaaran shuttle cockpit in TNG: "Liaisons"
In contrast to the Yridian shuttle, the Iyaaran variation has two identical standard seats in the front part of the cockpit. 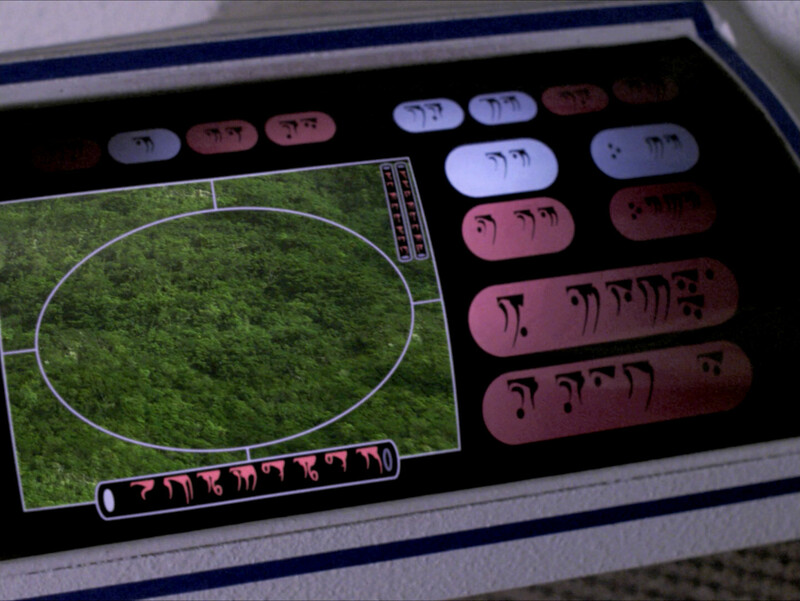 All consoles, including those of the captain as well as of the Ops station, are mostly unchanged and now exhibit Iyaaran interfaces. All consoles feature a triangular element in the middle, separating the surface into two smaller consoles. 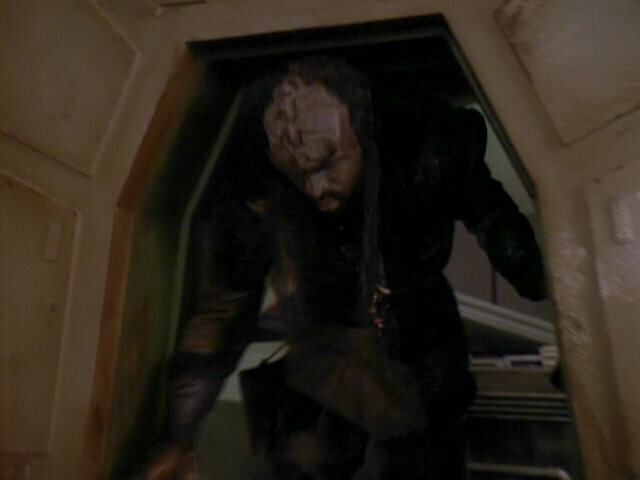 The door frame to the aft compartment is still the same as on Shrek's ship and has no door likewise. 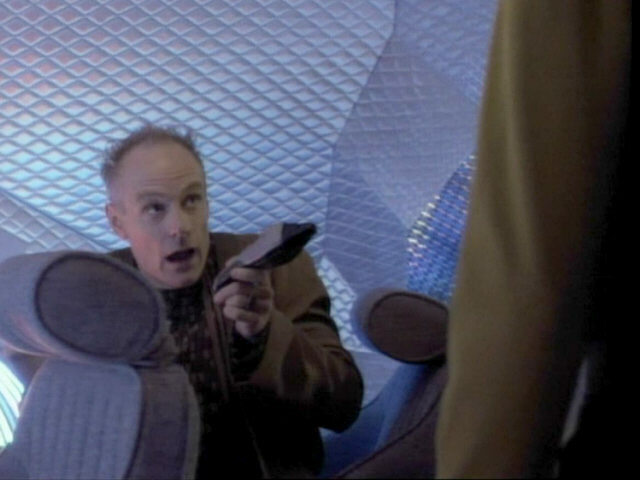 Iyaaran shuttle aft compartment in TNG: "Liaisons"
The aft cabin is relatively empty. It seems there is some sort of a bench in a recess, and a shelf on the opposite side. Inside the Klingon Toron-class shuttle the Iyaaran console is still in place, along with the triangular partitions of the interface. 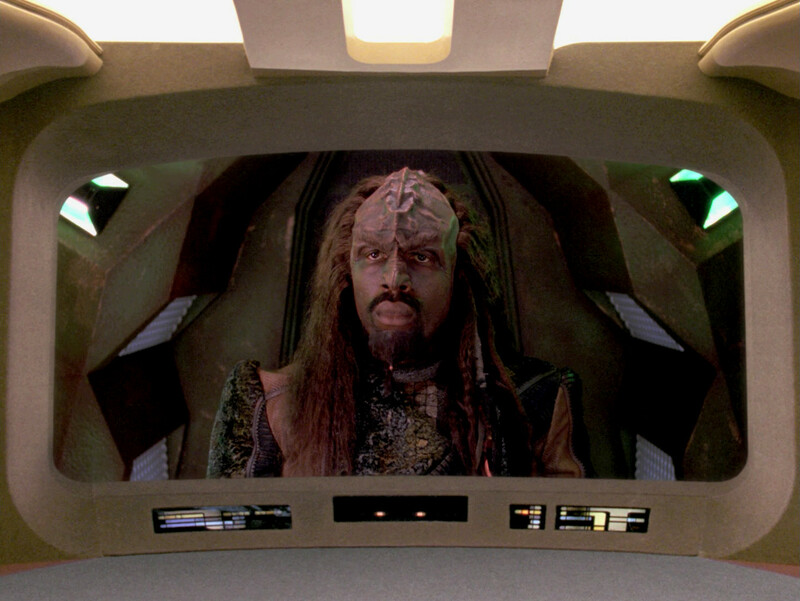 Klingon Toron-class cockpit in TNG: "Gambit II"
Klingon Toron class in TNG: "Gambit II"
In the front view as visible on the main viewscreen we can see the front window of the shuttle, which is still pentagonal. It is separated into three segments, by two vertical struts. 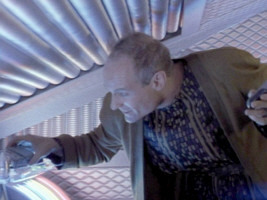 These struts, however, were not in place when the scene was filmed in which Koral climbed off the shuttle. Here we can see through the whole big window without any partitions. As neither the inside of the shuttle nor the window were supposed to be visible, this small mistake occurred and went unnoticed. In the aft part of the shuttle, the walls are dirty brown. The four illuminated areas are still where they used to be on the previous appearances. 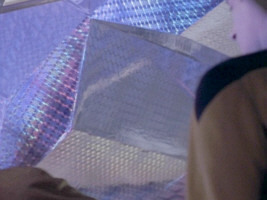 They are covered with the same translucent materials as in the Iyaaran shuttle. Two new greenish lamps were added, pointing forward. They are used to let the inside of the shuttle appear green. This episode shows the shuttle interior for the last time. 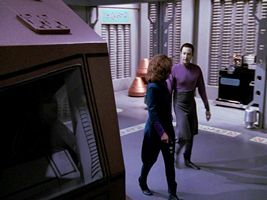 After the end of TNG the set may have been scrapped. 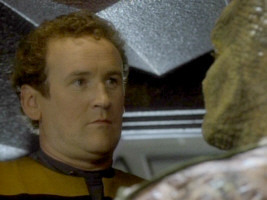 It neither appeared again on DS9, nor on Voyager. In TNG: "Preemptive Strike", the cockpit appears as that of a Maquis fighter. It was obviously planned from the beginning to use the alien shuttle cockpit for the Maquis ship. 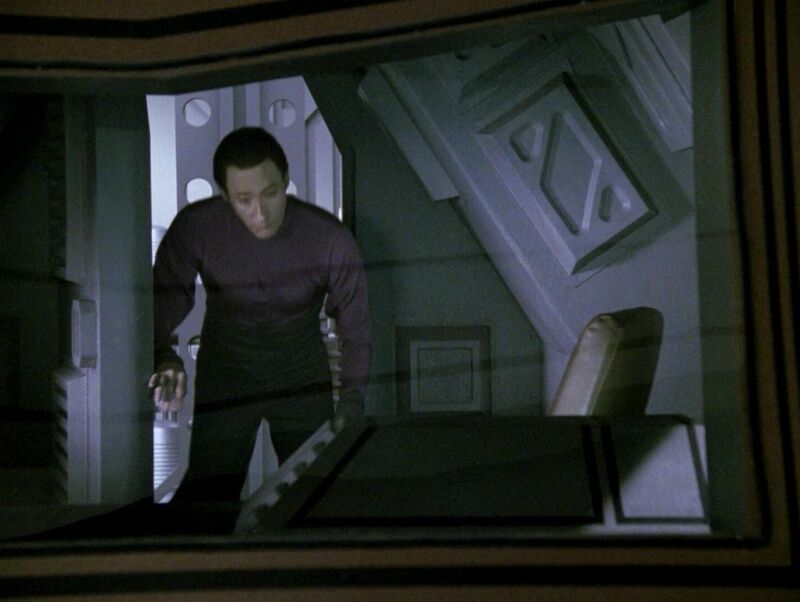 We can see that the front window and the two side windows visible on the Maquis ship model correspond with the windows of the interior set and mock-up. 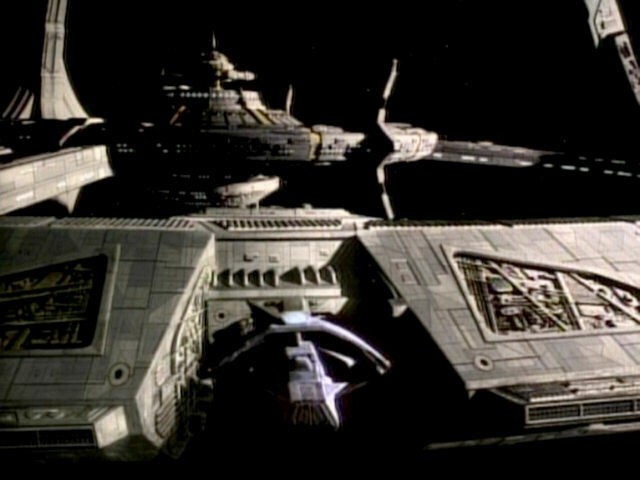 The model was later modified and the "cockpit" replaced with a "bridge", to represent Chakotay's supposedly larger vessel in VOY: "Caretaker". 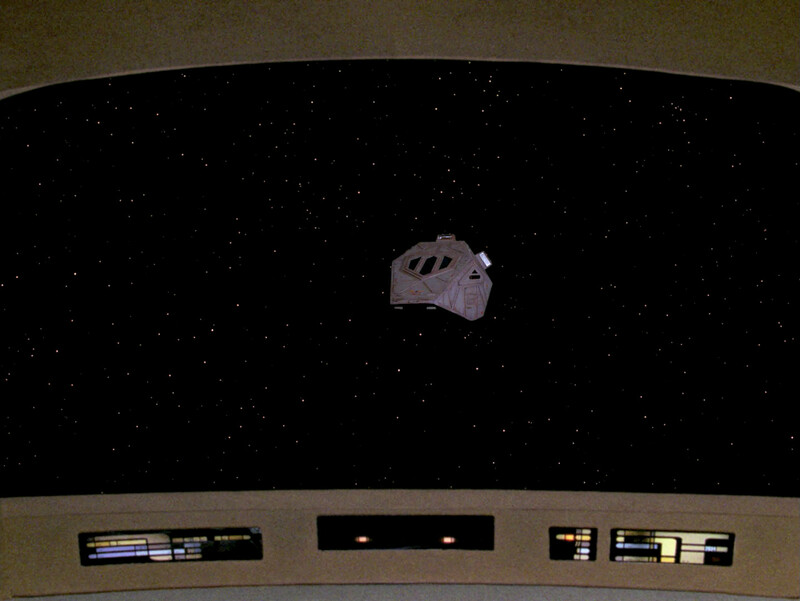 Maquis fighter cockpit in TNG: "Preemptive Strike"
We can see the upper as well as the lower lateral cockpit windows in the episode, but not the windshield, which should still have the characteristic pentagonal shape visible from the Iyaaran variation. 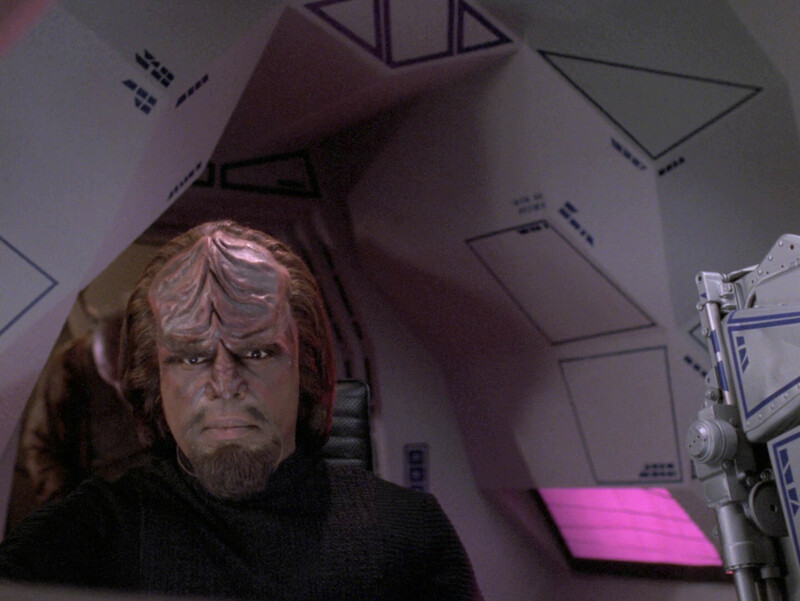 The aft area of the cockpit set is nearly unchanged. The walls were painted light gray and decorated with rectangular shapes of Okuda's typical black marking tape to be more "Starfleet". 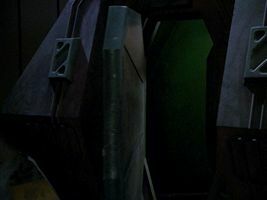 The aft section still has an octagonal aft door, and the connecting door is still heptagonal. 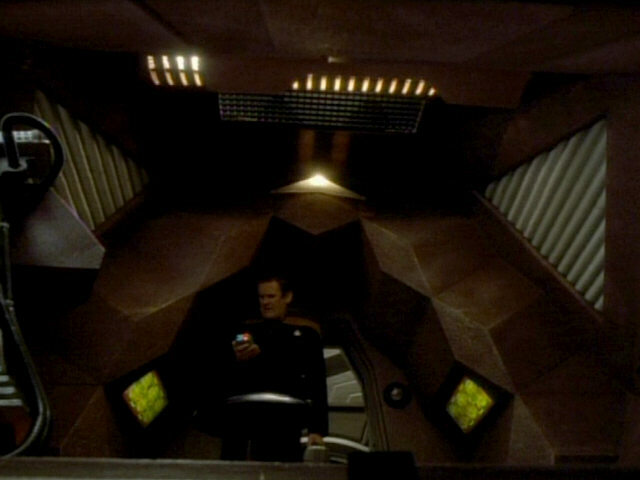 The four lighted areas are unchanged since "Liaisons" and still covered with the same translucent material. 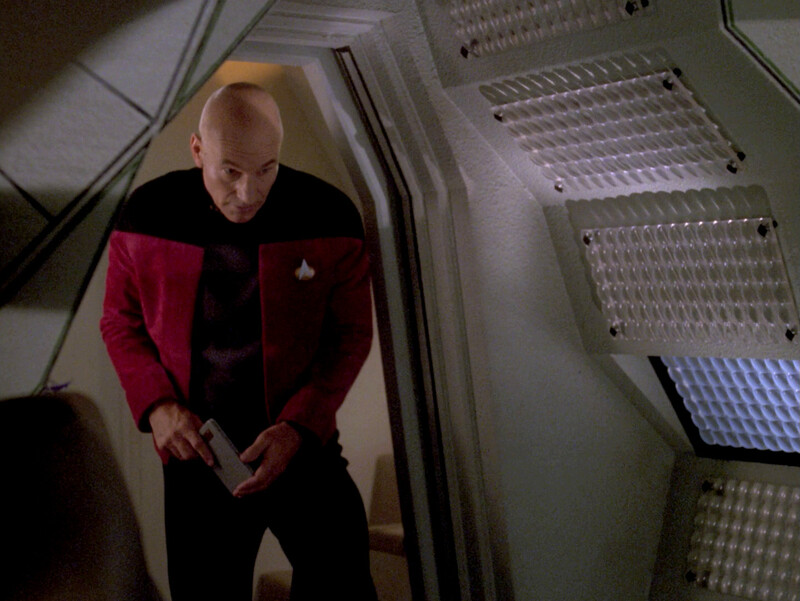 There is one noteworthy change, however: The lateral console, as it existed since "Final Mission", was removed. 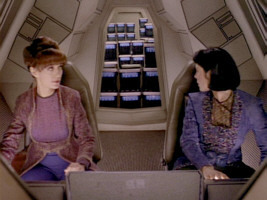 The pilot and the co-pilot are sitting side by side on either side of the central console. 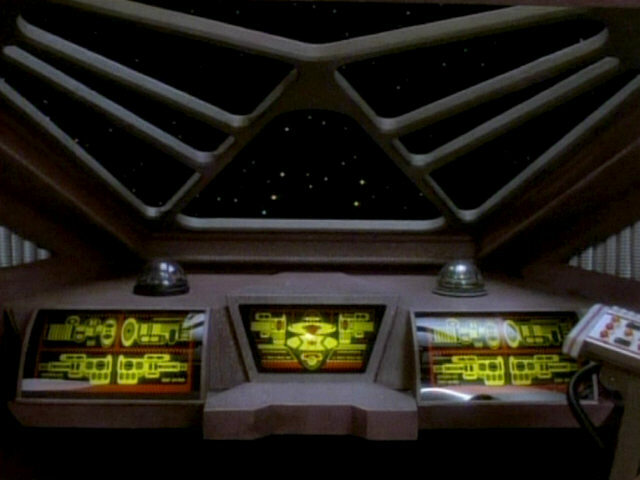 We can still see the central trapezoid console and the two lateral ones. 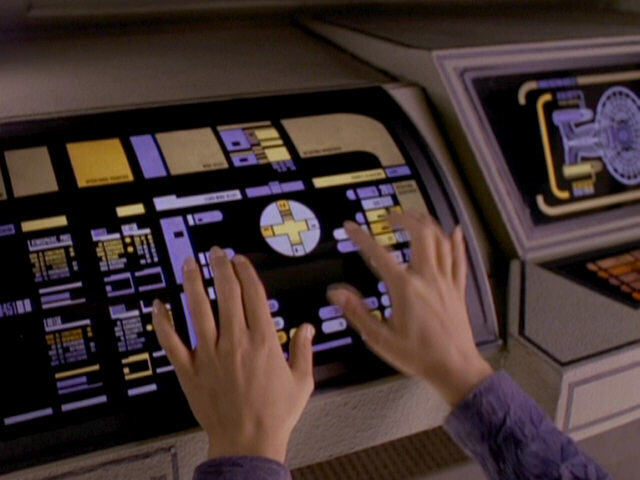 The consoles were overall only slightly adapted, by swapping the displays for (almost) each new incarnation. 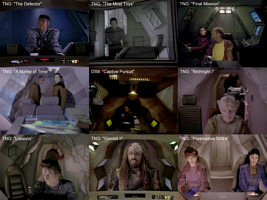 The comparison image shows the best available head-on views of the variations of the alien shuttle cockpit.